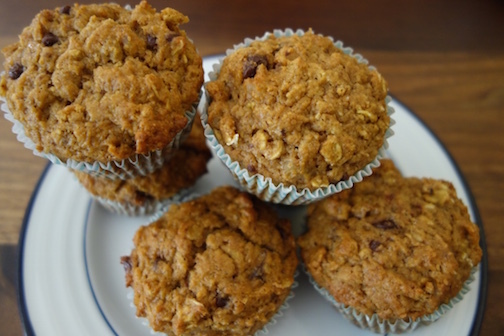 I know it is not pumpkin season but these healthy muffins are still really, really good- I make them for my daughter for breakfast. They are great to have in the fridge or freezer all the time. I just take them out, cut them in half, and toast them with butter- really delicious and really good for you! A glass of milk and some berries on the side- it is a perfect breakfast! Heat oven to 400 degrees F. Line 15 to 16 standard size muffin cups with paper liners. In a large bowl, mix together the flour, oats, baking powder, baking soda, salt, cinnamon, ginger, cloves, nutmeg and sugar. In a glass bowl, melt the coconut oil and add the yogurt, milk, pumpkin puree, egg and vanilla extract. Whisk well and add to the dry ingredients. Add the walnuts and chocolate. Mix well and divide batter between the muffin cups. Bake for 15 to 18 minutes or till the toothpick comes out clean.